a new high-end two-way speaker kit.The Mimir consist of an 18 cm long throw woofer with a coated paper cone -CA18RNX, and a 27 mm coated fabric tweeter -27TDFC . The Mimir loudspeaker is based on a standard 14 litre vented cabinet that is available assembled and finsihed at some DIY loudspeaker shops. This cabinet was chosen to give people an easy start to building a loudspeaker. 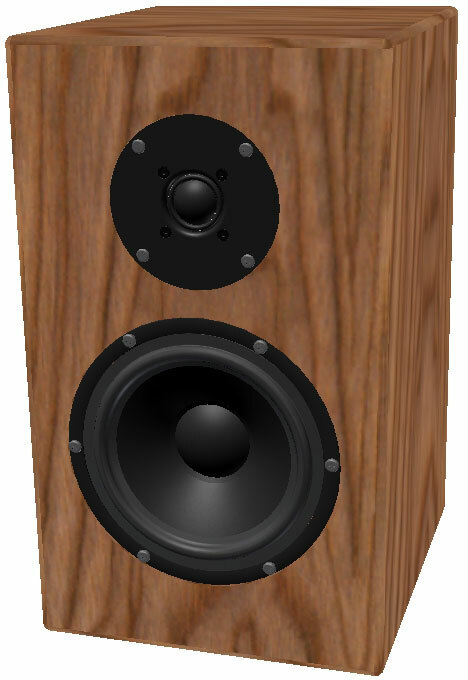 Ask your local loudspeaker dealer if he can help you obtain this, if your not thinking of building it yourself. The important thing to remember when you are building this, is to keep the bafﬂe width and internal volume of the original enclosure. Adding braces to stiffen the cabinet is a good tip for the advanced builder to take the loudspeaker just a little bit further. The amount of stufﬁng and port tuning is based on measurements and extensive listening. The cabinet is ﬁlled with 100 g of Acousto-Q. The stuffing is distributed evenly in the box, but kept away from the port opening to allow free movement of air. This to ensure that the airﬂow noise stays as low as possible. The port length is 20 cm including the ﬂanged end and the inner diameter is 5 cm. This gives a port tuning of 42Hz providing a smooth low frequency roll-off. The woofer used in this system is the SEAS CA18RNX . This is a long throw 18 cm woofer with a coated paper cone. The classical coated paper cone gives a smooth extended frequency response with a controlled roll off. The large magnet system gives good transient response, and the bumped back plate together with the very long, and light weight copper clad aluminum voice coil allow for extreme coil excursion with low distortion. The extremely stiff and stable injection moulded metal basket, keeps the critical components in perfect alignment. Large windows in the basket both above and below the spider reduce sound reflection, air flow noise and cavity resonance to a minimum. The tweeter is the SEAS 27TDFC . This is a 27 mm High Definition precoated fabric dome tweeter with a wide, soft polymer surround. The dome and surround materials give high consistency and excellent stability against variations in air humidity. The voice coil is wound on an aluminum voice coil former with adequate ventilating holes to eliminate noise from internal air flow. The voice coil is immersed in low viscosity magnetic fuid, for high power handling capacity and simplifed crossover design. A stiff and stable rear chamber with optimal acoustic damping allows 27TDFC to be used with moderately low crossover frequencies. The chassis is precision moulded from glass fibre reinforced plastic, and its front design offers optimum radiation conditions. For detailed technical parameters on the drive units see the data sheets. The crossover is designed in LspCAD from IJData, with the objective to obtain a simple design without sacrifcing the overall quality. Driver response and impedance were measured with the drivers mounted in the box at 1 metre distance 15 degrees off the tweeter axis in an anechoic room. This reference point was used in the design to minimize the influence of baffle edge diffraction. By measuring the drivers at the same point it is easy to simulate the summation of and phase response between the drivers. The crossover was developed empirically, without confinement to the traditional textbook filter formulas. The drivers should be in phase at the crossover frequency, and the sum should be flat when both drivers are at -6dB relative to the pass band level. Now the inevitable vertical off-axis cancellation, which is always present with the use of non-coincident drivers, is at least outside the listening axis (tweeter axis). To accomplish the design goals it was necessary to use a 2nd order electrical filter for the high pass section, with an “l-pad” for attenuation because of the different sensitivities of the drivers. The low pass section was realised with a 2nd order electrical filter and a baffe-step compensator consisting of a parallel connection of an inductor and a resistor in series with the driver, thus providing a flat frequency response. 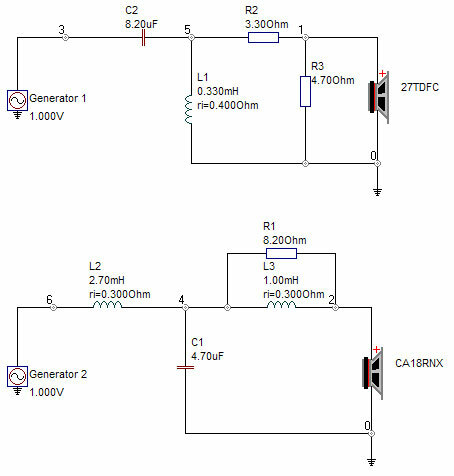 The crossover schematics is shown in figure 2. 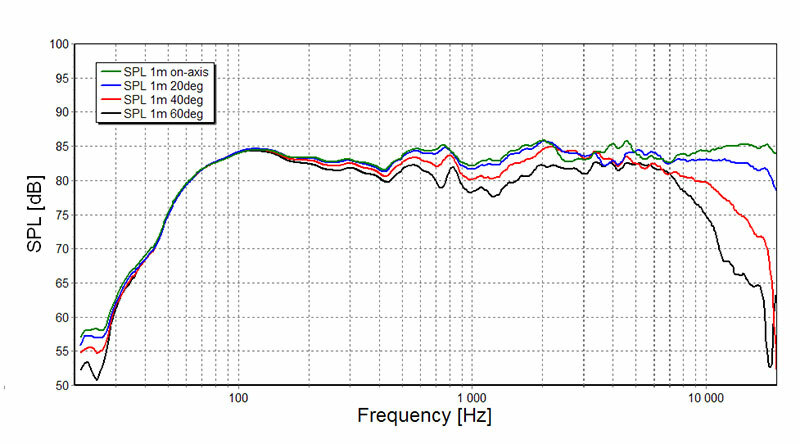 Anechoic free field response at 1 meter, 15 degrees off tweeter axis, measured at 2.83V. As seen in the figure the average sensitivity is 84dB and the response lies within ± 2dB. The black curve shows the response with the tweeter connected with opposite polarity. In this curve we look for a deep and symmetrical notch around the crossover frequency, which indicates that the drivers are in phase in the crossover region. 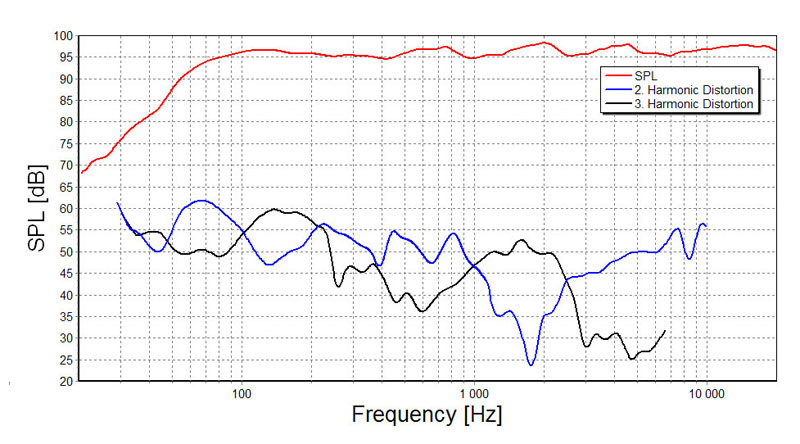 Here the notch is more than 25dB deep, and that confirms that this system has a very good phase response. The blue and green curves show respectively the response of the woofer and the tweeter. The 2nd order electrical crossover combinedwith the natural roll-off of the drivers gives a 4th order acoustical Linkwitz-Riley slope. The crossover frequency is 2.2 kHz, high enough for the tweeter to operate inside its limits, even at high amplitudes, and low enough so that the woofer doesn’t become too directional, and thus providing a smooth power respons. The off-axis respons of the Mimir is shown below. 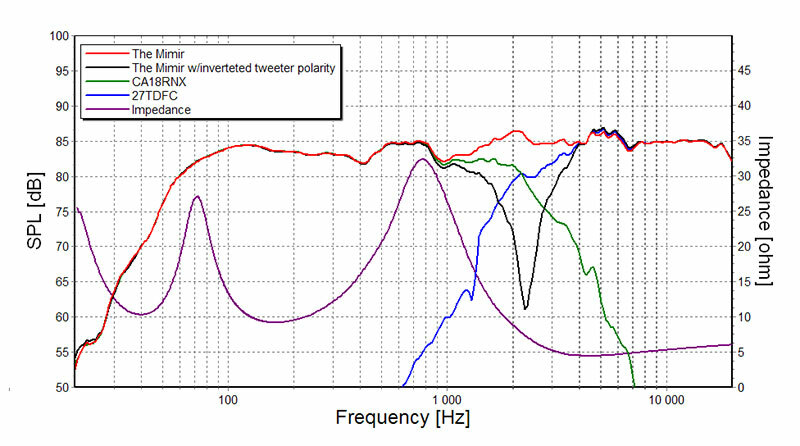 This figure shows that the power response is very smooth throughout the whole frequency range, and the controlled off-axis roll off of the tweeter. The next figure shows the 2nd and 3rd order harmonic distortion with an output of 96dB at 1m. The overall distortion is very low and without any peaks that might become noticeable. This makes the reproduced music very clean and without coloration.